Getting hooked on balloons was something I had heard a lot about from the people around me that also know about hot air balloons' pull. After I got my balloon ride at this year's media flight night I witnessed how cool it was to work as crew for the balloon. I realized it was something I wanted to try. I'm get excited by thing that require amounts of functional strength, something that I strive to earn in my workouts. I built a relationship with my balloon pilot, Al Smith, who flies Northern Lights out of Grass Lake, MI. After the Hot Air Jubilee was over I let Al know that I would like to offer myself as a volunteer crew member, should he ever need me. Turned out he needed me pretty quickly and the very following weekend I got to try my hands at balloon chasing. I joined the rest of the crew at 6:20 a.m. at Ella Sharp Park. Three balloons would be going up, taking up a few sponsors from the Hot Air Jubilee. For about an hour we waited out rain and poor weather conditions before it was decided that we were going to launch from a more southern location. Once we finally got in position to launch the balloon was rolled out onto the grass. Myself and another newbie crew member stood on either side holding the massive balloon open as the large fan inflated it with ambient air. I think we both were just as giddy to be there and though we couldn't talk, we kept smiling at each other from across the balloon. When the balloon is almost fully inflated with air the burner is turned on to heat the air up. At this point the balloon was becoming harder and harder to hold onto so I was glad when Al let me know I could go ahead and let it go. Before we knew it the balloon was standing fully upright on its own. We held down the basket as the two passengers climbed in. Once the final tether was released we waived goodbye and we calmly but some of the supplies back in the van, hopped in, and started on the next phase of our journey-chasing. The pilot uses an app called Glympse on his phone and he is able to share with us a GPS signal of where he is going. We spent the better part of an hour keeping an eye on him in the sky, watching him move across a small cell phone screen, and determining where he was headed and what roads would lead us to him. It was a fun and exciting morning with three other women. We had eyes on the other two balloons that were flying and from time to time would cross paths with the other chase crews. Having the app was very helpful, but I can't imagine the days when that was not available. We had radio communication with the balloon too, but hardly used it. Once we finally determined Al was ready to land we sat and waited in the van just ahead of him to anticipate his arrival. Once we saw him coming down quick three of us jumped out of the van and sprinted about the length of a football field to be there the moment he touched down. He landed in a field so we ran through rows of cut down straw. It was a pretty gentle landing and we got hold of the basket right away. The basket was laid down and the passengers hadn't gotten out yet, so it was a hilarious sight seeing them curled up in the fetal position and we tried giving them a hand to climb out. Once squeezing out all of the air from the balloon it's stuffed into a large circular bag. It feels a lot like stuffing a sleeping bag for a giant. After everything was loaded we all rode in the van to the launch point for us to get our vehicles. 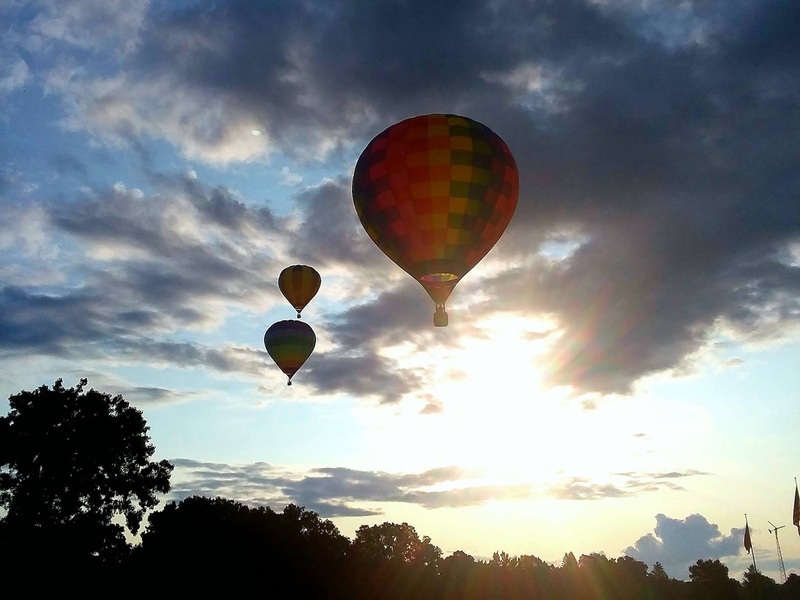 Ballooning can have a lot of waiting involved, but when its "go" time it can be one of the most exciting things ever!